Ecclesiastical eyesore destroys view of Shard! 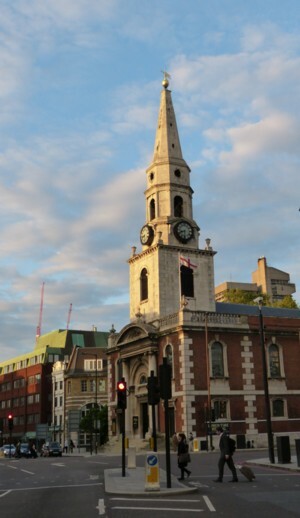 That is a church called Saint George the Martyr. I’m just kidding (I had in mind sentiments like this) about the church being an eyesore. Saint George the Martyr looks very nice, and I find these two buildings particularly pleasing when they are thus aligned. Earlier I had taken another picture of St George the Martyr and the Shard, but from further away. The church looks smaller, just as you would expect. But the Shard looks bigger the further away you get from it, because it becomes so much clearer that it actually is so very big, and so much bigger than everything else. My more serious point is that the Shard, far from being an alien and intrusive presence, actually fits into big old London very well indeed, not least because it echoes some of London most characteristic and most loved architectural shapes. That’s what I think, anyway. Some declare themselves offended by the Shard, as has already been noted here. But for me, London without its recent crop of skyscrapers would be a less appealing and far duller place. Had the Shard only got as far as the pretend photo stage, but had it never actually materialised, I’d have been very sad. If lack of money had caused that, well, that happens, when boom turns to bust. But had the Shard been politically aborted because of its alleged aesthetic offensiveness, I would have been offended myself. 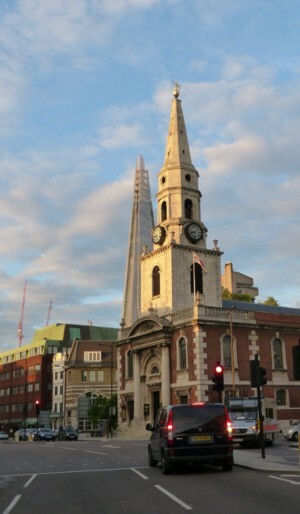 15 comments to Ecclesiastical eyesore destroys view of Shard! One of my problems with the Shard is that the Marxist moron Ken Livingstone made sure it only has 48 parking places, and most of those are disabled spaces, and this for a building meant to house shops, offices, apartments and a hotel. Apparently everyone is meant to arrive by public transport to satisfy the deranged anti-car hatred of the communist buffoon. John K, For real? Does the Shard only have 48 parking spaces? Bwahahahahahahahaha! Unfortunately the Shard reminds me of that wonderful hotel in North Korea, the Ryugyong. Both of them look like they owe their design to post modern architecture tweaked to give a hint of 70’s Sci Fi spaceships. I hope the Shard is a greater success than the Ryugyong, but if it only has 48 parking spaces…. Bwahahahaha! They wouldn’t have built such a huge building with only 4 dozen parking spaces??? Must be looking forward to the levitating-car era! There really is something quite Whovian about the Shard. If ever you notice that Saint George the Martyr has some new angels weeping for him, I recommend you back away quickly without blinking. Believe it, I heard Red Ken boasting about this “achievement” when the building opened. Like all communists he hates cars and believes the little people should travel by public transport at all times. He revels in the fact that he cannot drive as if it is some sort of badge of honour. He revels in the fact that he cannot drive as if it is some sort of badge of honour. That will result in a priceless irony, then. He will be perfectly positioned to enjoy the soon-to-come era of micro transport, when tiny autonomous vehicles by the millions fill our cities and finally put an end to mass transit. Back on topic, I like the Shard; when the light catches it at a nice angle it looks magnificent, such as on a cold, sharp winter’s day. And here I drift off again: I doubt whether uncle Ken needs either cars or Public transport. All the peoples’ servants are driven by chauffeur, surely? Yes, the Shard looks interesting and I doubt too many angels are concerned with architecture, as such, per se, etc. Creative genius will figure somewhere, though. I rather like the Shard; although the parking situation, if accurate, urgently needs addressing and will very likely have considerable detriment to the desirability of the building as a home or office, until it is. I think the top “crown” looks a little odd, but I suspect it’ll grow on me. The Standard article may well be right, in that Wren probably wouldn’t like it (and after all, it’s not that long since the Standard was produced by the same group which prints the Daily Hatred); however, as your photo suggests, Hawksmoor probably would :-). JohnB, the “weeping angels” is a Dr. Who reference. Agreed about the top of the Shard looking a bit odd. This is the main departure of the real thing from the visualisations, i.e. fake photos. I think what they didn’t see coming was that, what with there being no internal partitions up there, the light comes straight through, and the floors are emphasised, the way they aren’t anywhere else below. I suspect there may be further changes to come up there, when it gets filled in, so to speak. I have many pictures of it looking as it does now, and will be looking carefully to see what, if anything, happens up there next. Or then again, maybe what we now see is what we will continue to get. And pictures will soon start appearing, here and elsewhere, of tiny people in silhouette, inside. Some taking photographs no doubt, which is one of my particular photographic enthusiasms. I believe he has always used public transport, and therefore believes everyone else should too. His hatred of private cars is well known, and resulted in the London “Congestion Charge”, which helps to price the little people off the roads. Oh, I see: ‘can’t’ meaning ‘doesn’t know how to’. Close up, taken during the same journey as I took the snaps in the posting, of the top of the Shard, here.